Once upon a time, when athletes in Ancient Greecestarted competing in rigorous events at Olympic Games,slices of cheesecakes were made, which basicallycontained the three basic ingredients: cheese, wheatflour and sweetener. They pounded all the ingredientstogether until it attained a paste-like consistency. They baked the mixture, cooled and served to provideathletes with the energy they need to… compete. Thiswas known as the birth of the cheesecake. 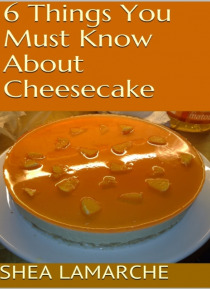 In this ebook, you'll find helpful tips on:-6 Tips About Cheesecake You Can't Afford To Miss-Cheesecake Cooking Syles-And MoreGRAB A COPY TODAY!